Sending bulk SMS messages requires compliance with rules and regulations you should know about. This short article covers the nearly-universal basics for all marketers. Your local jurisdiction may have additional regulations with which you should be in compliance as well. Telemarketing has long been a large industry both in the US and worldwide. With the invention of SMS via mobile devices many of the laws that previously applied only to calling have now been adapted to include SMS. We’ve included some of the laws you’ll want to be aware of when sending SMS below - note that we didn’t include SMTP (email) specific regulations such as CAN-SPAM. Below are just a few requirements for sending SMS. There are actually even more strict guidelines for those sending SMS via ONTRAPORT. The short version is if it’s not an opted in SMS phone number, it can’t be sent via ONTRAPORT. To avoid any complications make sure that you’re always delivering on the promise made at the point of opt in. Please direct any specific questions to our Postmaster. Only send SMS to opted in contacts. Do not scrape SMS number for marketing purposes. Keep your messaging consistent. Do not send your contacts offers they did not opt in to hear about. Make it clear who is sending the SMS using your brand or business name. Do not send messages without proper labeling - there is a good chance your contacts will not know your SMS phone number at first, and may block you. This article covers the basics of SMS Compliance. Creating a SMS number, subscribe and unsubscribe options, and managing your SMS campaigns is covered in our SMS Overview article. Arrive from the owner of the device. Display the marketer and all companies that will have access to the customer’s phone number. State that standard messaging fees apply. COPPA: Don't gather information (or send SMS to) children 13 years or younger. The Federal Do Not Call List: "The National Do Not Call Registry" gives consumers a choice whether they would like to receive SMS or telemarketing sales messaging. After a phone number has been on the list for 31 days they should not be messaged unless there is prior consent. Now that you know the rules, do you want to jump right in using SMS in your ONTRAPORT account? Click the question mark icon in the lower right of your account and open the Step by Step Guides section. 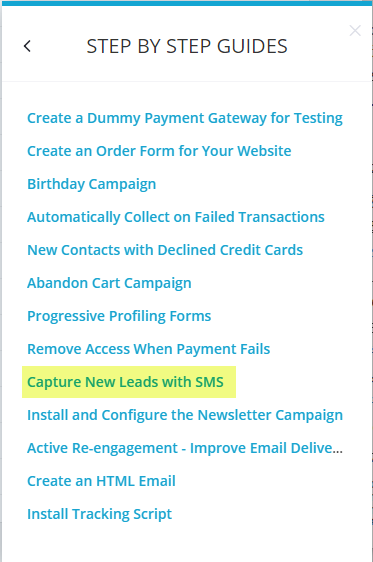 Select the "Capture New Leads with SMS" guide to get started! For all the details on setting up your SMS number, the default time zone, etc. see the SMS Overview knowledge base article.